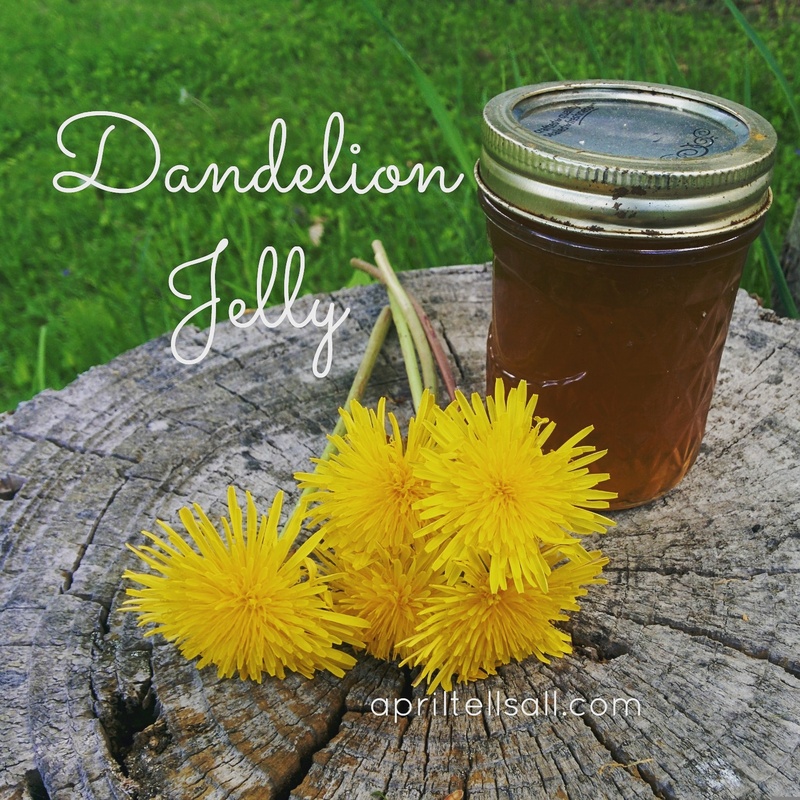 Dandelion jelly was something that I kept seeing pop up among my fellow blogger and instagram friends. They all claimed it tasted somewhat similar to honey, and the idea of making food from my own yard appealed to me. So I told Hubby to hold off with the lawn mowing so I would have enough of the beautiful yellow flowers to make jelly with. Personally I love dandelions. I love the pop of colour they provide to an otherwise plain old green yard. My lawn mowing Hubster does not agree. He gauges when it is time to mow again by how much yellow is in our lawn. Try as I might I cannot convince him that dandelions are not only an amazing and healthy wild food for us, but also for the goats, chickens, and insects (including honey bees) that live here. I give him praise though on how long he did hold off. But finally he began threatening them with the mower so I got outside with my bowl to collect some heads before they were all mowed down in their prime. Lawn mower loving husband and wild child wife don’t always mix. Dandelion jelly recipes are basically all the same. You use the flower part (the least bitter part of the plant) to make a tea then turn the tea into jelly. It really is a simple process, however collecting enough dandelion petals can be tedious. 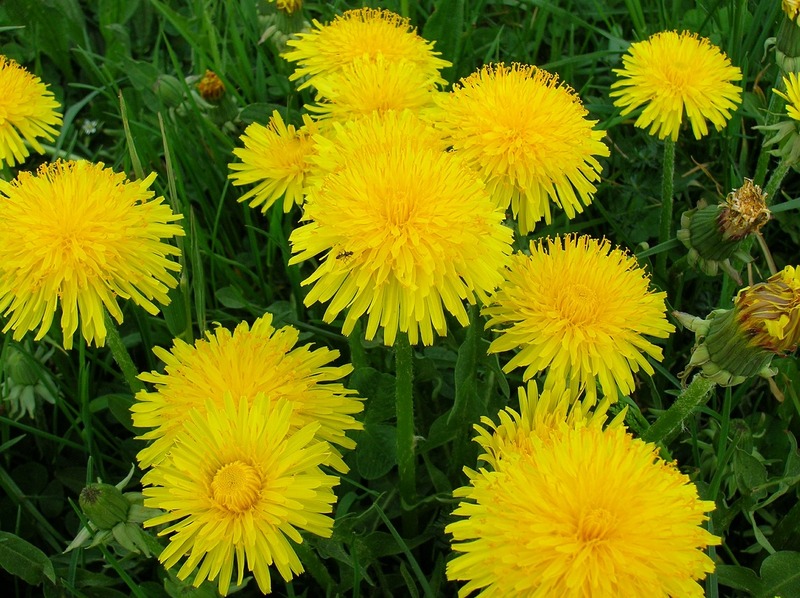 Also be sure to pick your dandelions from a place that you are sure has not been sprayed. 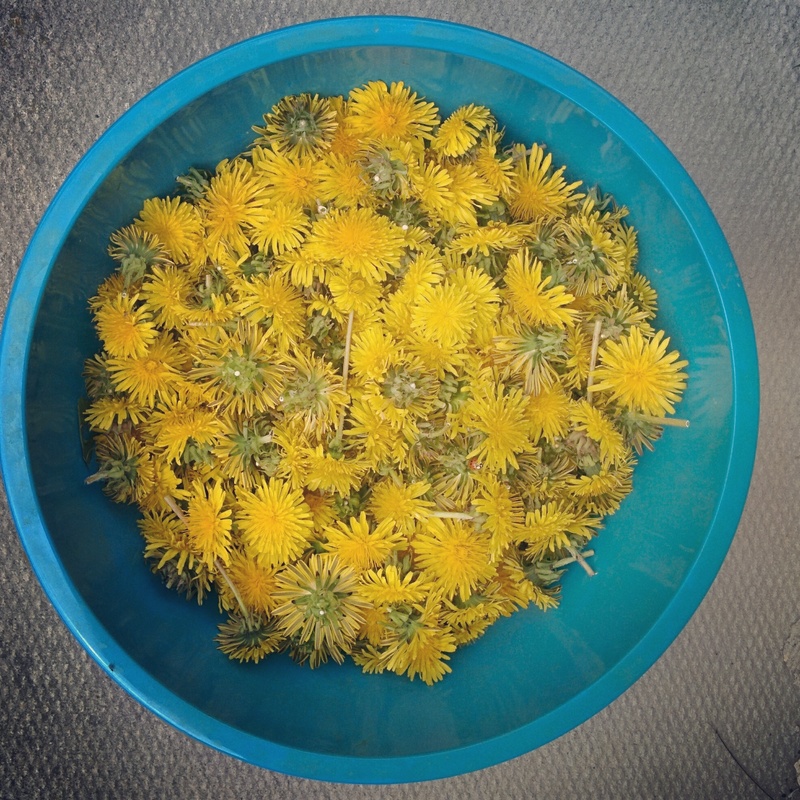 I picked the dandelions for our jelly from the far side of the house – well away from dogs and their business, goats, chickens, and the road. We don’t use any chemical sprays at all, so I knew the dandelions were clean. I started out by collecting 8 cups of dandelion heads. If you have kids this would be a great job for them. Then dumped the flowers into a sink full of cold water to give them a quick rinse. This removed *most* of the ants, spiders, and beetles I had crawling around in the bowl. Then came the hard part. Plucking the petals. If you get a bit of the green in with your petals it isn’t a huge deal. You just don’t want too much as it can make your jelly bitter. Several suggestions I read from other recipes were to snip the petals just above where the seeds were, others plucked them individually. Others still said to cut the dandelions just above the seeds while out picking them (as opposed to picking the heads, and then snipping them). I ended up plucking the petals by hand. I had a good system going where I pulled out the middle then around the edges. I didn’t worry too much about getting every single petal. The end goal is to have 4 cups of petals. I threw all the ends and bits to the chickens and the goats, who proceeded to just walk over them and not eat them. What appreciation. Once you have your 4 cups of petals, cover with 3 cups of boiling water and allow to steep for several hours. I left mine overnight. And then stuck it in the fridge for one more day after that, when I realized I didn’t have any pectin, but couldn’t make a trip into town. Really though you only need to steep it for a few hours. With pectin in hand I set out to making the jelly. I ran my jars through the dishwasher to sterilize them, and got my water bath canner heating up. Strain the dandelion tea through a jelly bag or cheesecloth that has been folded several times; I used my milk filter. You want to remove all the petals from the tea. Pour the strained tea into a large pot and add the pectin and lemon juice. Allow to come to a rolling boil then stir in the sugar all at once. Return to a hard boil again and let boil for a minute and a half (or however long it says for the pectin you’re using). Remove from heat, and skim off any foam. Ladle into hot jars and process in a water bath canner for 10 minutes.